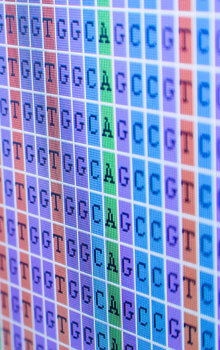 Researchers at EquiSeq identify genetic variants using whole genome sequencing. In this process, all of the genetic material of a horse is fully analyzed. The complete sequence of the genome of a horse being analyzed is compared to the reference genome of the horse, which is actually a composite of the genome of a number of different individuals. Any individual horse will differ from the reference genome at literally millions of positions. Some of these differences can be associated with specific traits affecting health, performance, coat color, and other traits. Some of the differences will be sites of neutral genetic variation that are common to all horse breeds. Other differences will be rare genetic variants that have never been seen in another horse. Horse owners who have obtained a complete genome sequence from EquiSeq will have the option of making their horse's complete genetic profile public. This will allow any registered user of the EquiSeq site to see the genotype of the horse with respect to all reported traits, although the vast majority of the millions of sites of variation will not be reported. Horses have been selected for whole genome sequencing based upon their value to EquiSeq's ongoing research programs. If you are interested in obtaining a complete genetic profile for your horse, please contact EquiSeq for details.